100% fluoride free, no saccharin and no artificial colouring. 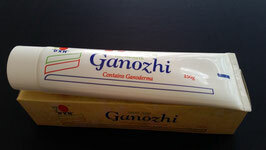 Contains high quality Ganoderma, food gel and menthol. It leaves a fresh pleasant taste in your mouth after using it. Used regularly will whiten and brighten your teeth. Ganozhi Toothpaste is not just ordinary toothpaste. It can also relieve itchiness and inflammation from bites, soothe minor burns, and is an anti-bacterial paste to prevent infection. It is highly recommended by natural dentists to help aid in curing gum-disease and prevent gum disease from returning. Apply a small amount giving you big results. You save by only using a tiny amount compared to conventional commercial unnatural brands, making it more economical. 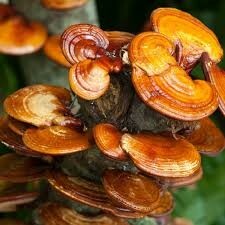 Ganooderma Lingzhi or Reishi is a kind of mushroom which has high ranking in the world of fungi. For centuries, the Chinese and Japanese regard it as the "King of Herbs" for its excellent effect in aiding, assisting or helping in the maintenance or improvement of general well-being. In Chinese, the name lingzhi represents a combination of spiritual potency and essence of immortality. It symbolizes success, well-being, divine power, and longevity. Among cultivated mushrooms, G. lucidum is unique in that its pharmaceutical and contains up-to 400 nutrients making its value paramount. The major elements includes polysaccharide, adenosine and triterpenoids. Ganoderma is classed as an ADAPTOGEN as it can help our body adjust to stress, trauma, and fatigue.